I was really excited to try growing potatoes vertically in a tower this year. 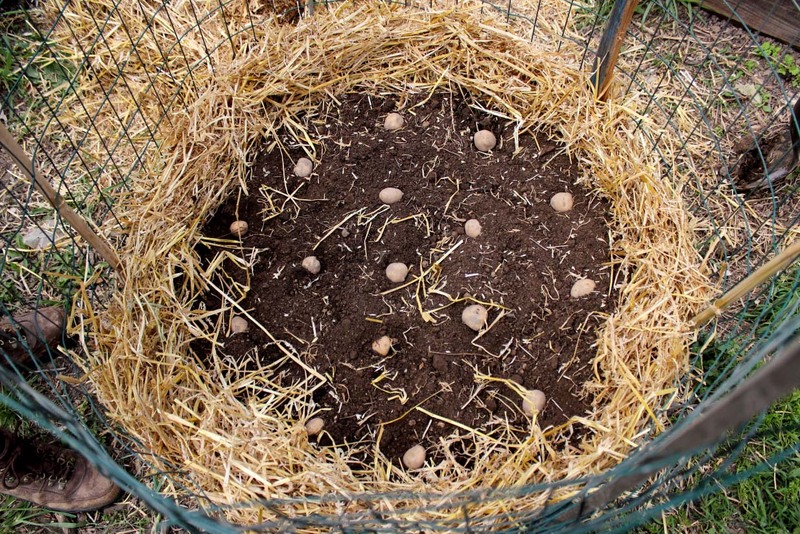 We didn’t have enough space to plant our seed potatoes in traditional mounded rows, and I had read about high yields from potato towers online, so it seemed like the perfect method. 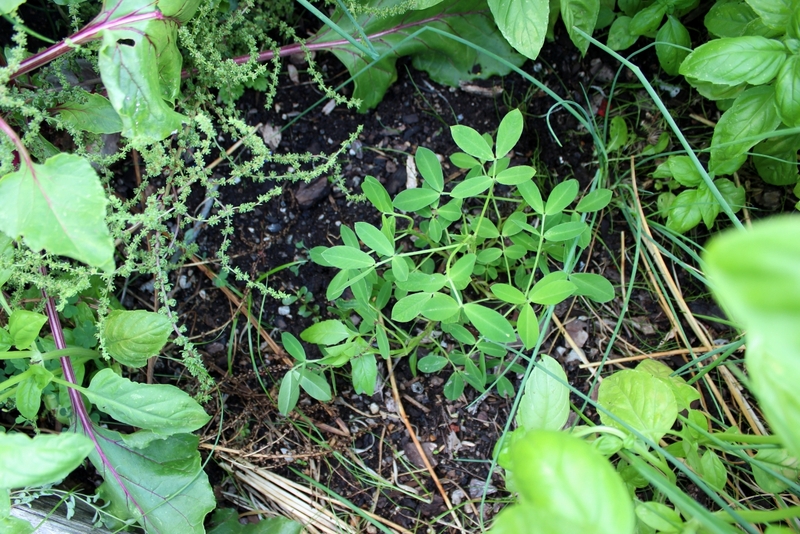 We planted our seed potatoes in the tower in early April and watched the greens grow steadily upward. 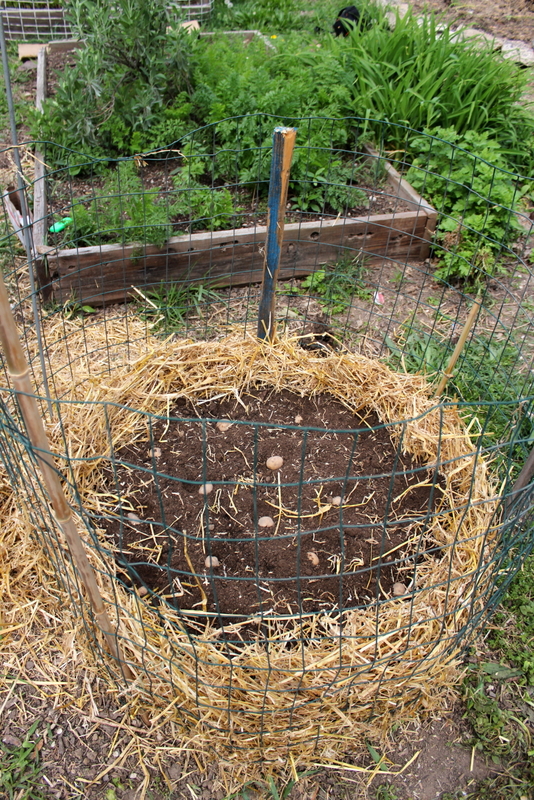 We continued to add soil, compost, and straw to promote more stem growth, and thus more tuber growth. 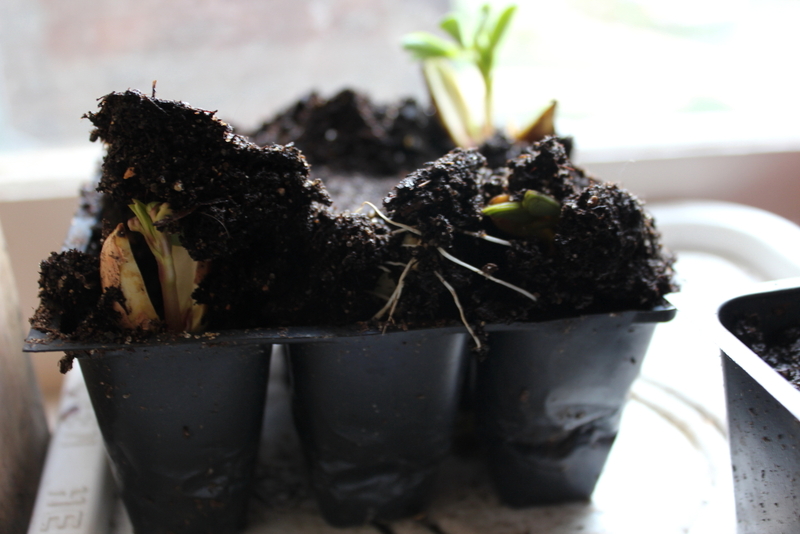 I was feeling pretty positive about the experiment until a couple weeks ago, when the greens stopped growing– some even seemed to die off completely. I blame the heat– we didn’t see any pests to blame. We had kept the tower pretty well watered, but two weeks in the 100s did a lot of damage. So, yesterday we decided to harvest our potatoes. With most of the plants dying off, we didn’t want to risk the potatoes rotting in the ground. One of the other claims made by potato tower enthusiasts is that harvesting is easy and doesn’t involve as much digging as in traditional potato farming. 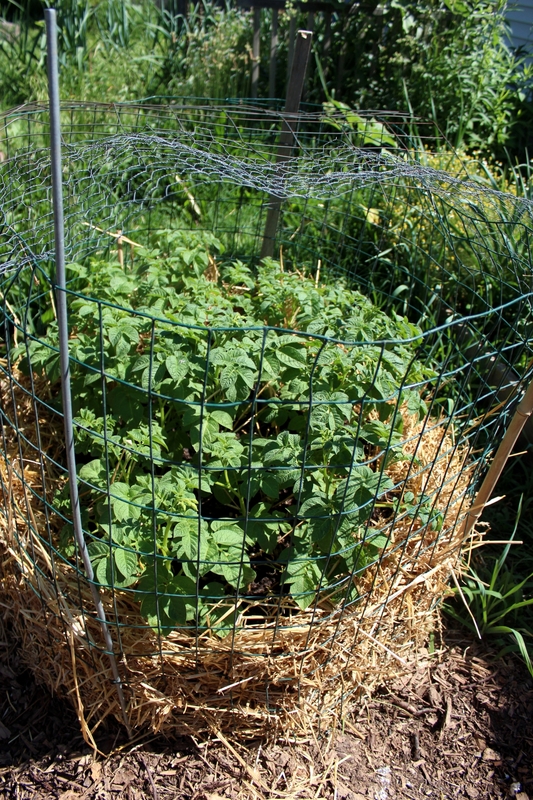 Silly me, I thought we’d just unroll the wire fencing that held the tower up, and out would tumble our potato bounty. Nope, the tower kept its shape without the wire. Not wanting to accidentally slice any of our hundreds of expected potatoes, we figured we’d better dig into the tower with our hands instead of a shovel. There were no potatoes to be found. Lots and lots of earthworms, some of the biggest I’ve ever seen, but literally no potatoes. Eventually we decided to cut our losses and dig in with a shovel. No potatoes until we dug to the very base of the tower. After three feet of disappointment, it was highly satisfying to finally find some potatoes. Unfortunately, they numbered only slightly more than the original seed potatoes we planted. We haven’t decided yet if we’ll eat our harvest or re-plant them. In the end, the potato tower, though touted for its high yields and space efficiency, turned out to be a dud for us. We love the idea of vertical growing to save space, and the theory behind potato towers seems sound. I might think about trying it again next year if we don’t have the room, but ideally we’ll have enough space to plant them in rows in the ground. This year our big plant experiment (besides the onion experiment) is peanuts. The plants below were transplanted from seeds we started inside. We also direct seeded, since it was difficult to transplant the tender seedlings. Just an experiment… we’ll see if it’s worth it! 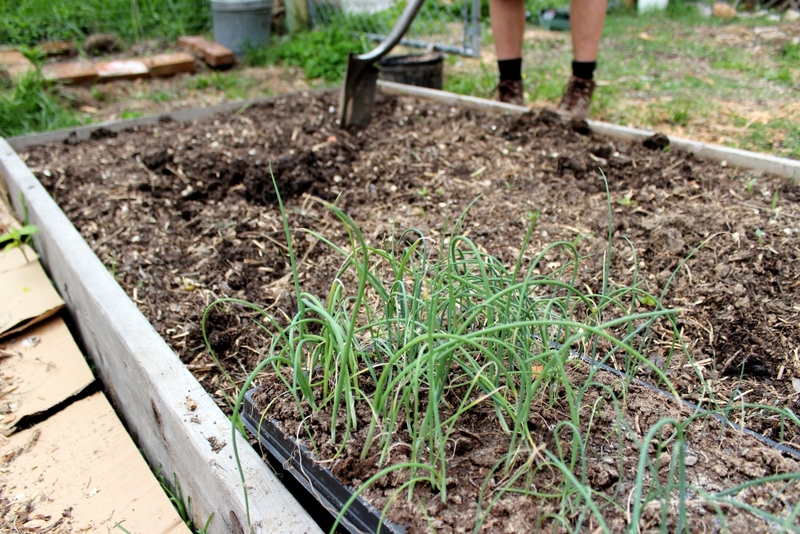 As you may recall from our previous Onion Experiment post, we started onion seeds on February 2. 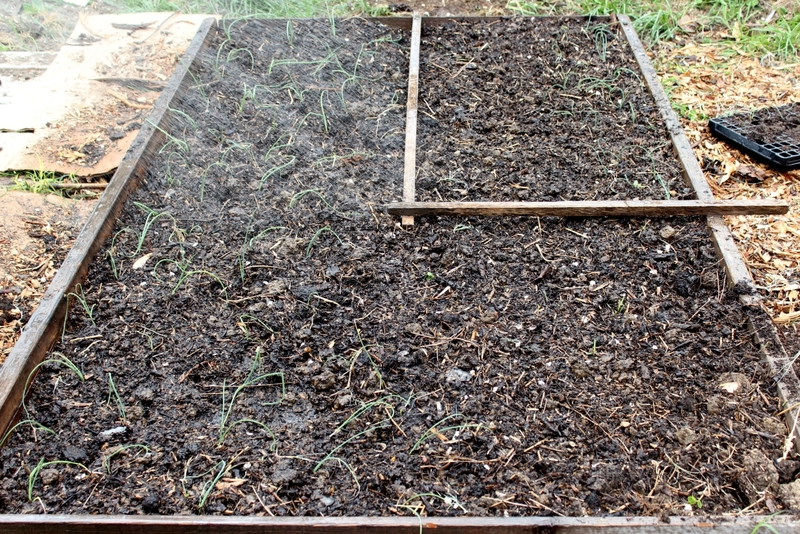 One group was started in a tray with individual holes for each onion seedling, the other in a wide, shallow pot. 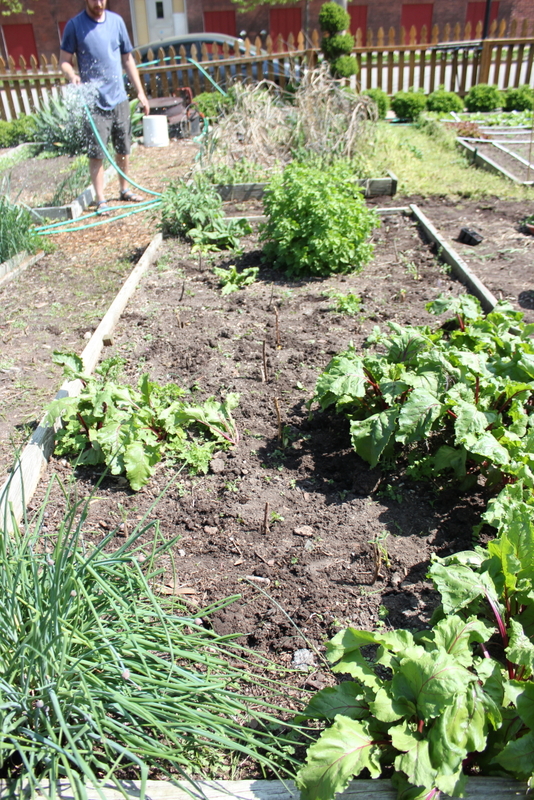 We transplanted both groups into a freshly-composted bed at our Iowa Street Garden on April 3. 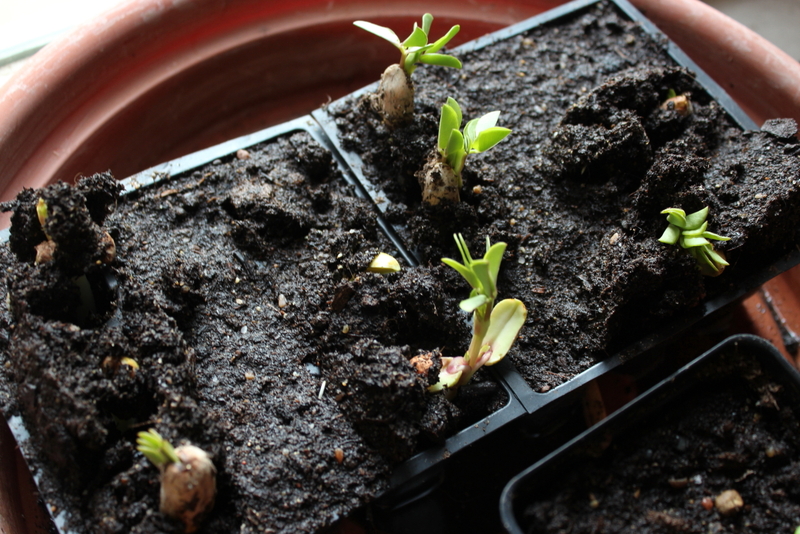 We found that both groups were easy to transplant, though the seedlings in the tray seemed to grow larger. 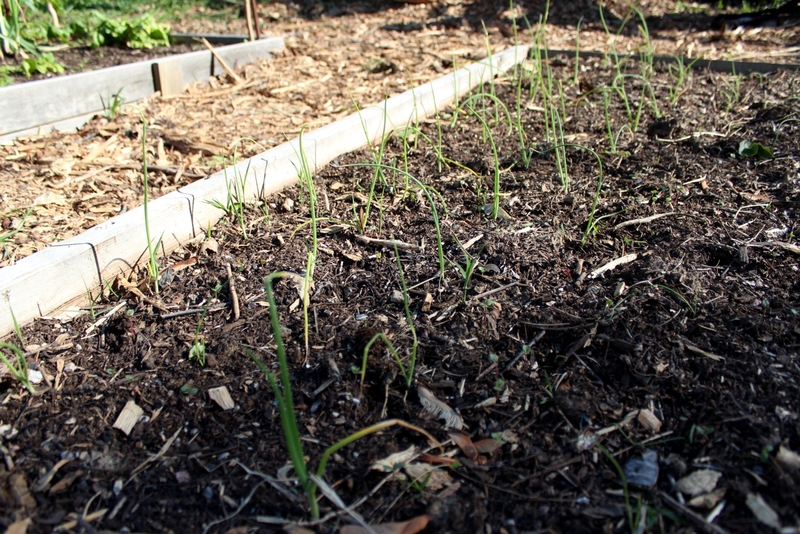 By mid-April, all the onion seedlings were perky and strong. The chickens at Iowa Street (not our chickens!) escaped their run and scratched up the bed a bit, but luckily there was little damage. 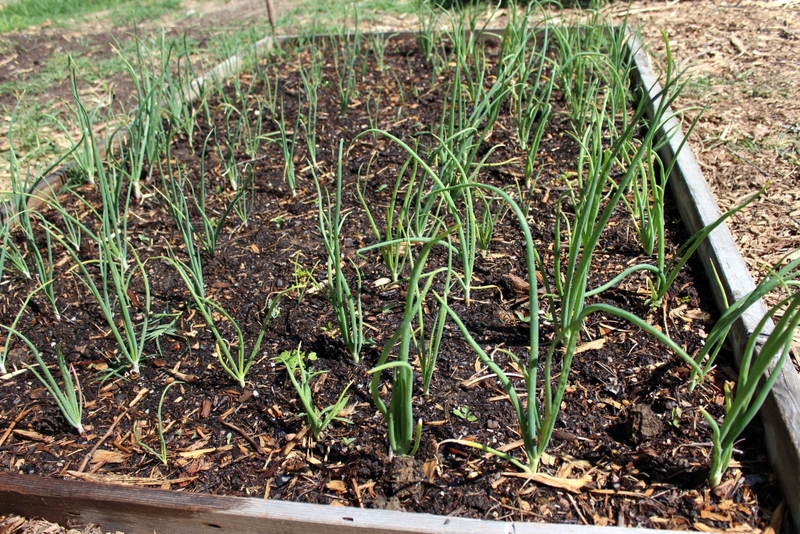 It’s mid-May and all the onions are looking healthy. 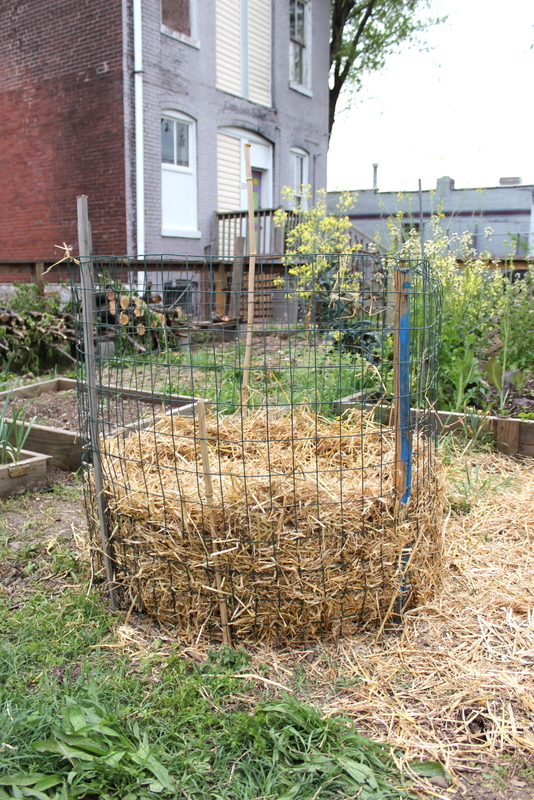 We attribute this to the homemade chicken-manure compost we added before planting. In addition, we’ve fertilized with fish emulsion and seaweed tea to provide adequate nutrients. If we stay on top of the weeds (including the evil grass) and watering, we should have some healthy bulbs come late summer. It’s another experiment! Two years ago we grew potatoes in our community garden plot, planting in rows we mounded up- we were fairly successful. Last year we got a late start, so the harvest from our potato bed was pretty underwhelming. This year, we’re trying out the potato tower method. 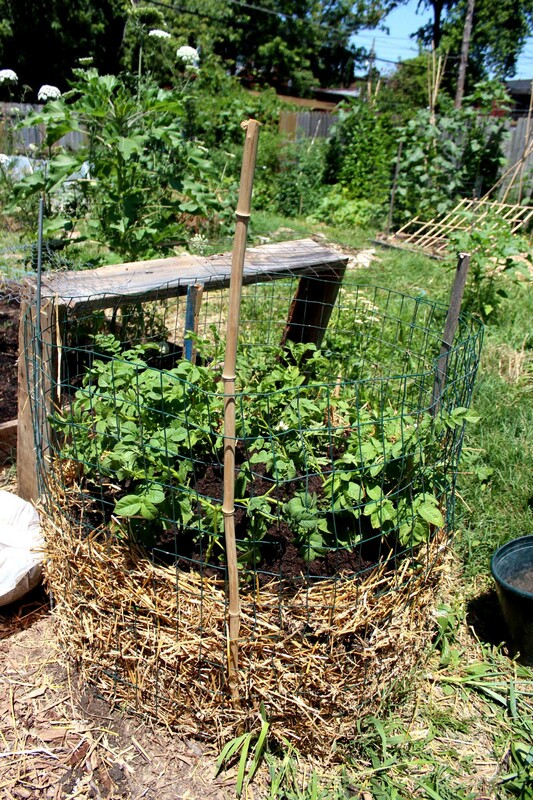 Potato towers are supposed to maximize your planting space by going vertical. Our research isn’t conclusive on how successful these are, with some people raving about their harvests but others claiming little growth. We decided to build our tower out of a roll of wire we had, making a cylinder about 4 feet tall with about a 3 1/2 foot diameter. 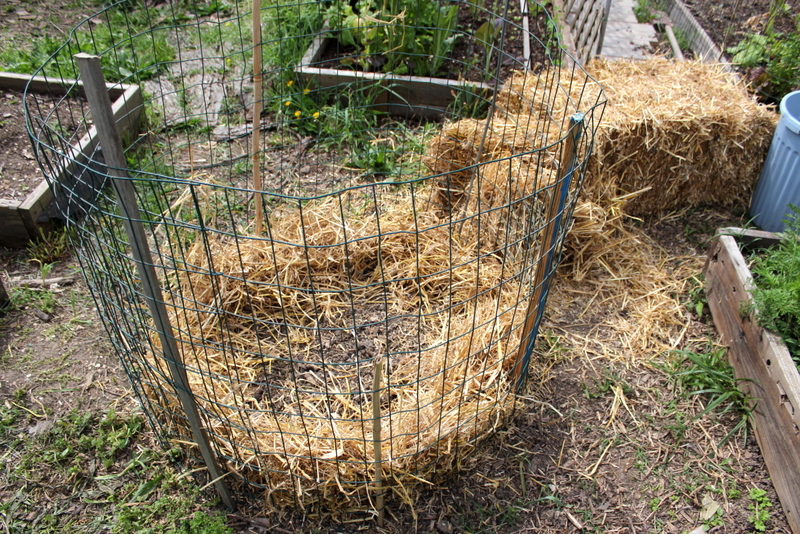 We stuffed straw down the sides to prevent the soil from falling out. 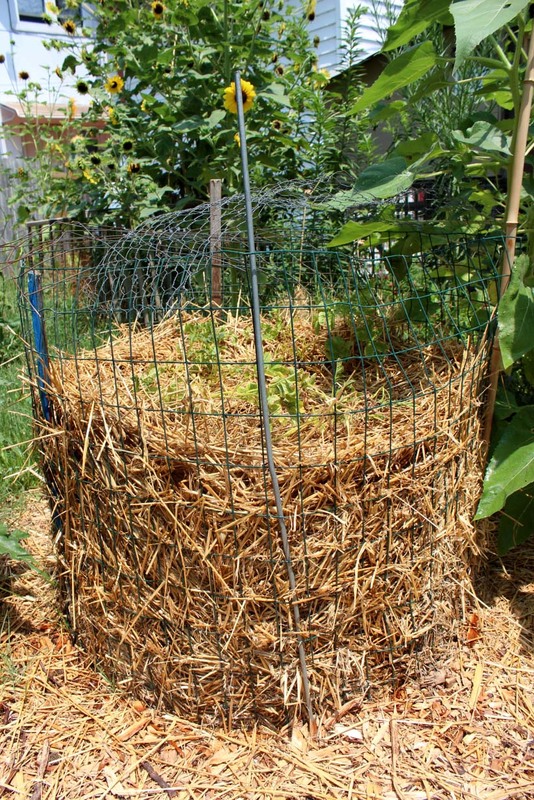 With the straw barrier in place, we loaded the tower with dirt and compost, mounding up about a foot and a half before we dropped in about a pound of our seed potatoes (from Grand Teton Organic Seed Potatoes). 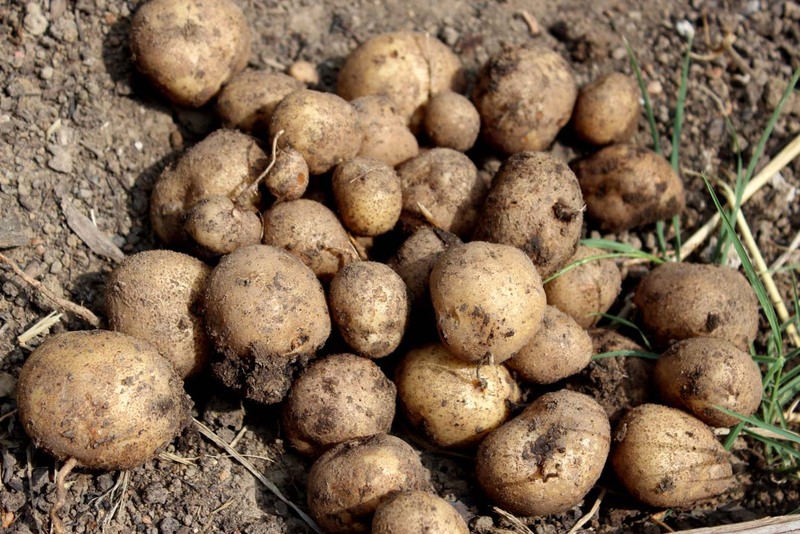 We read that late season potatoes perform best in towers, so we chose the Yellow Finn variety. We chose to build up the mound a bit before planting so potatoes will have room to sprout downwards and in all directions. 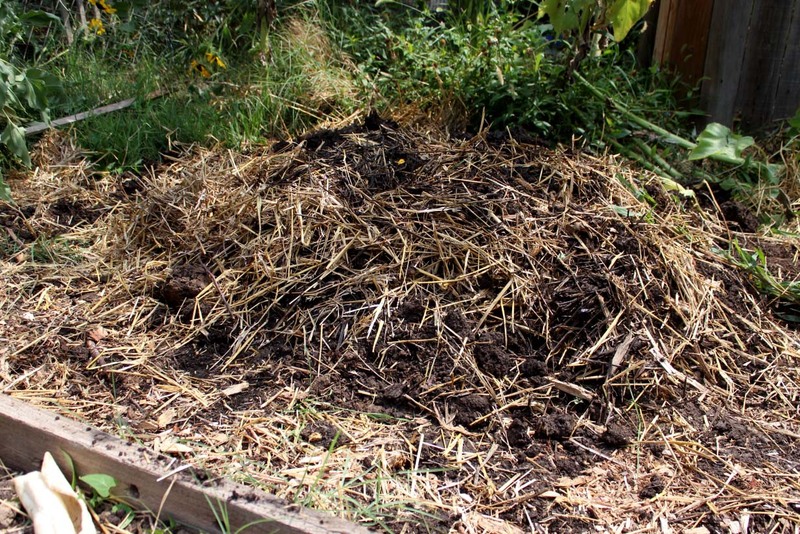 As the sprouts grow, we’ll add more layers of dirt, compost, and straw. 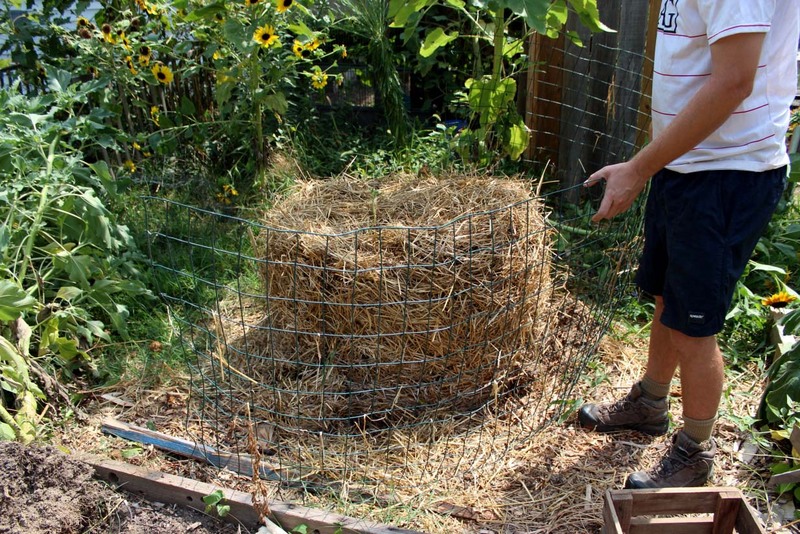 Ideally, this will encourage the sprouts to continue growing and provide more room for tubers to form. We may even have to build the tower higher! We’re hoping to exceed the standard of 1o pounds of potatoes from every 1 pound of seed potato. We do have another pound of seed potatoes to plant- time to decide if we’re building another tower or maybe trying the traditional mounded rows. 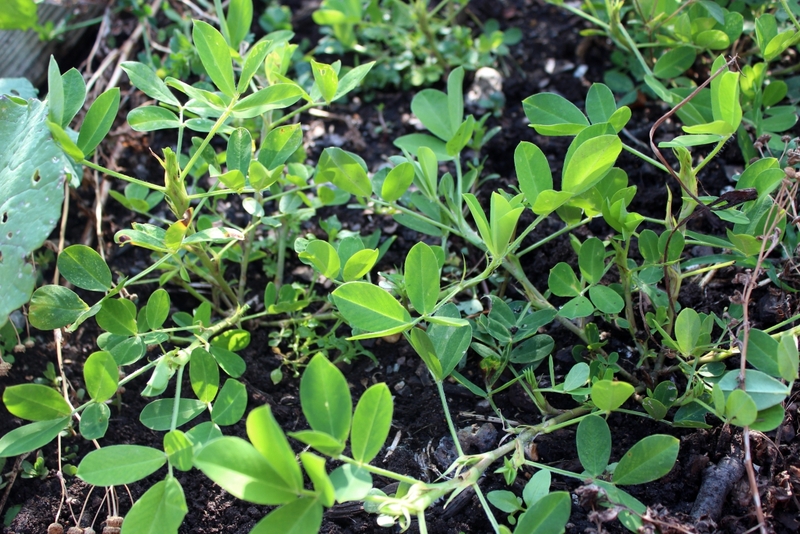 We transplanted our peanut starts in our community garden plot over the weekend. The peanuts are interspersed between the longtime residents of our plot. 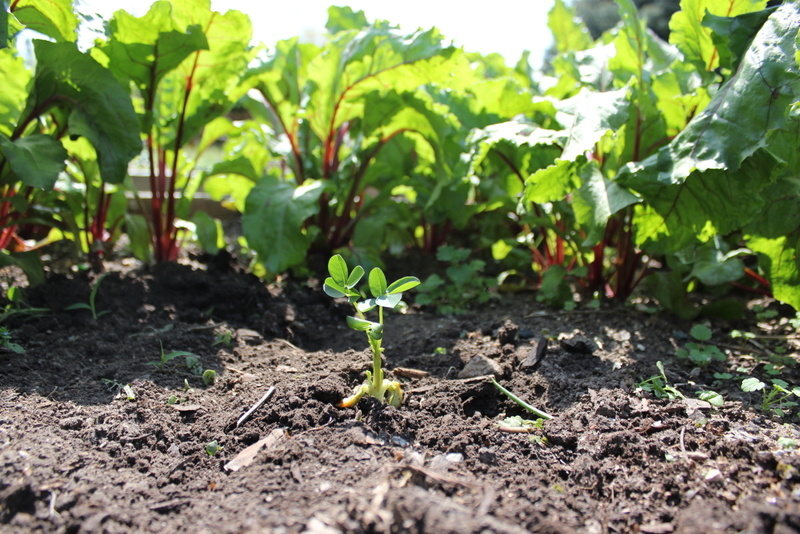 To the right is a clump of beets that were sown last fall. The previous gardener of our plot left the onion chives that live in the corner to the left, as well as the feverfew in the middle toward the back of the photo, and we planted the sage in the far left. It’s hard to see the little peanuts between everything, but we’ll keep updating with photos as they grow! We’re going to plant peanuts in our community garden plot this year. We shelled some raw peanuts we bought at the Soulard Farmers’ Market on March 19th. 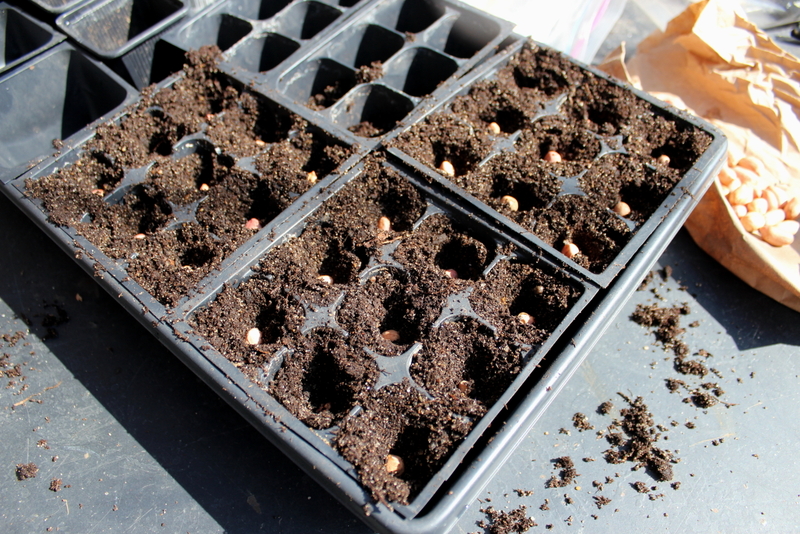 Then we popped them in some seed trays to sprout. We kept them well-watered and covered with clear plastic to retain moisture. The sprouts are pretty big… next time we’ll plant them in separate pots instead of the seed trays so they have more room. 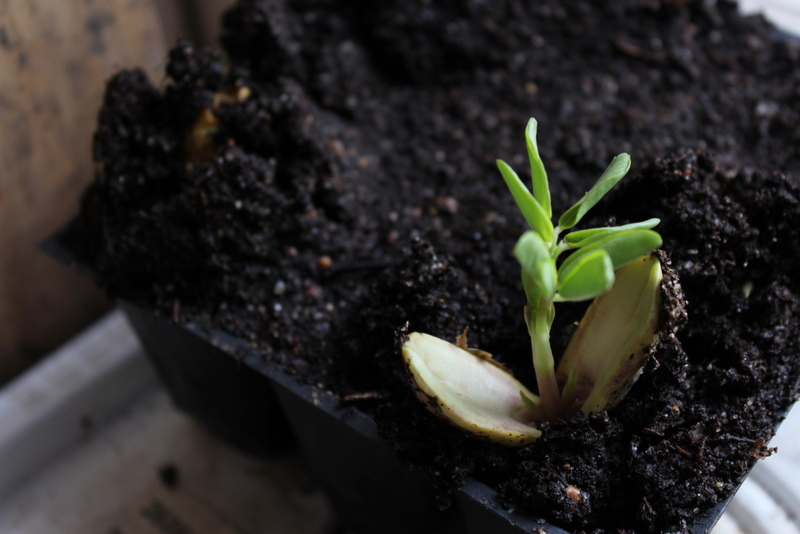 Some people suggest direct seeding instead of starting the peanuts inside because the roots are fragile, so transplanting may be a challenge. We’ll direct seed some as well. We can already taste the peanut butter!